HPA plans to reconstruct the entire west-half of Pier 12 wharf by installing a new steel sheet pile (SSP) wall immediately adjacent (outside) of the existing wharf, leaving the existing wharf in place. The new dock structure will be designed for an increased surcharge load rating capacity of 1,000 PSF, up from its original design capacity of 500 PSF. The new SSP wall will also be designed to allow for future maintenance dredging to a grade of 8.6 m below chart datum, however, there is no plans for dredging at this time. The project will be divided into two separate phases. 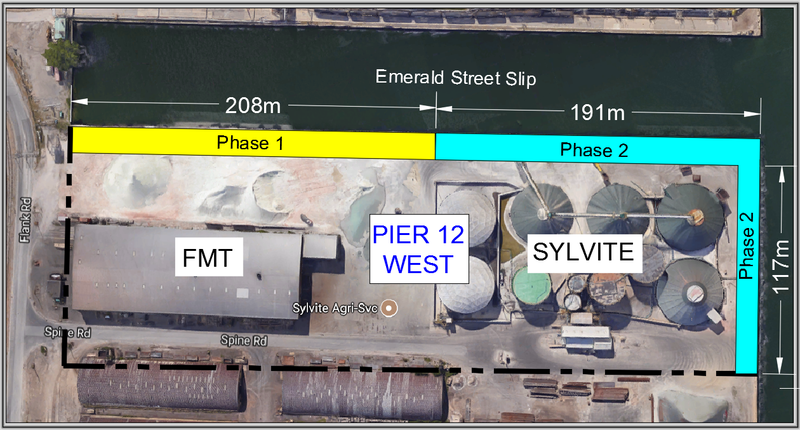 Phase 1 will include the southern half of the Pier 12 west-face wall along the Emerald St. Slip and Phase 2 will include the northern half of west-face wall as well as the west-half of north face wall (refer to diagram).